TOKYO, Jan, 24 2019 - (JCN Newswire) - Fujitsu has enhanced its clinical trial-supporting Fujitsu Life Science Solution tsClinical DDworks21 series with the launch of the SaaS solution tsClinical DDworks21/Trial Site. The new solution, available from today, provides hospitals and other clinical trial sites in Japan with shared cloud-based control of documents conventionally exchanged in paper form between pharmaceutical companies developing new drugs and the sites conducting the clinical trials. Clinical trial documents are records that prove a trial's reliability, so they are required by law to be stored long-term under strict control. Most clinical trial sites use paper records, and the exchange and storage of these documents remains labor intensive. After new drug approval, the documents must be managed properly for five years in Japan (in Europe, for a minimum of 25 years), a lengthy requirement that places a burden on hospital staff. The Trial Site solution reduces this operational burden and contributes to higher efficiency and lower costs. By adding this solution to the tsClinical DDworks21 series lineup, Fujitsu expands its business in the clinical trial field and contributes to the comprehensive optimization of clinical trials. New drug development is generally said to take 10 years and cost between 20 to 30 billion yen in Japan. In total, pharmaceutical companies in Japan spend 1.4 trillion yen annually on drug development, and lowering the cost of clinical trials represents a significant challenge. In recent years, various industries are increasingly going paperless by digitizing documents. In the medical field, while pharmaceutical companies, particularly in new drug development processes, are transitioning toward digitization, most clinical trial sites still operate by affixing seal impressions on paper documents in clinical trials. As a result, the printing of enormous quantities of documents generated during clinical trials, filing tasks, and securing storage space remain a significant issue. For pharmaceutical company staff (monitors) who repeatedly visit clinical trial sites to deliver and receive paper documents and check on storage conditions, reducing the workload associated with clinical trials is an urgent issue. To overcome these challenges, Fujitsu drew on its know-how in operational support for clinical trials gained through the development of the tsClinical DDworks21 series to create a new solution for clinical trial sites. At hospitals and other clinical trial sites, documents are managed as electronic originals on the cloud, and processes related to this management are streamlined and the quality is improved. Prior to launching this solution, Fujitsu conducted a field trial with National Cancer Center Hospital East and National Cancer Center Hospital. The trial verified higher efficiency and proper control of digitized exchange and storage of clinical trial documents as well as Institutional Review Board (IRB) operations. When clinical trial documents are saved as part of the electronic exchange with pharmaceutical companies and during hospital workflow, they are managed by the automatic generation of appropriate folders based on meta data, such as the time and date they were created and the name of the trial. This enables reliable folder management and version number management for each study as well as easy access for the most recent data. Furthermore, paperless operations means the enormous volume of filing and storage space required at clinical trial sites is reduced, so costs go down. Staff at clinical trial sites and pharmaceutical companies conducting clinical trials will use a specialized website to access data stored in a cloud environment, so operations previously handled manually at clinical trial sites by Clinical Research Coordinators (CRCs), such as printing and mailing paper documents, will be streamlined. This solution is also expected to reduce the workload of monitors from pharmaceutical companies associated with checking on document storage conditions at clinical trial sites. This will contribute to invigorating clinical trials in Japan and resolving issues affecting society, such as Japan's drug lag and device lag(1). 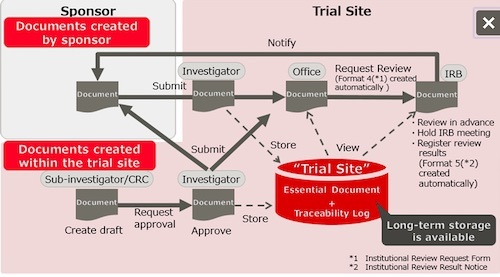 In this field trial, we successfully identified how to reduce operational burdens and increase efficiency for trial administrators by utilizing document digitization and systemized operation of process management. I hope this solution will be widely used by clinical trial sites and eventually link to tsClinical DDworks 21, which is used by many pharmaceutical companies. I have high expectations that Fujitsu will play a leading role as pharmaceutical companies and clinical trial sites share information on their respective needs and create a new platform. (1) Drug lag and device lag The wait period of a pharmaceutical product or medical device approved overseas, before it is approved in Japan.